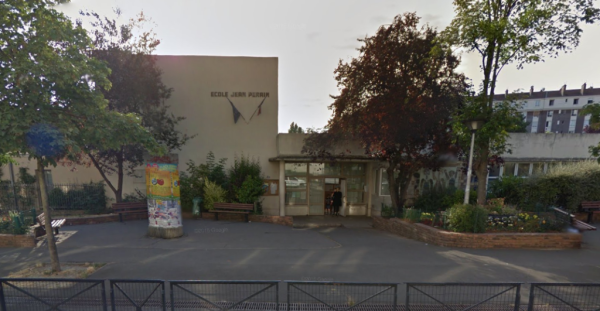 A French teacher has been attacked in a preschool class in Aubervilliers, a suburb of Paris, by a man citing ISIS. He stabbed the teacher with a box cutter or scissors before fleeing. The life of the 45-year-old teacher, who was alone in the room, is not in danger. France remains on high alert after the terrorist attacks in Paris on November 13 that left 130 people dead. Police sources said the teacher was stabbed in the side and throat at about 07:10 local time as he was preparing for class at the Jean-Perrin preschool, which caters for children between the ages of three and six. The attacker reportedly arrived wearing a balaclava and gloves but was unarmed and used weapons he found in the classroom. The attacker fled on foot and is still on the run. A manhunt is under way. Local official Philippe Galli said there were no children present at the time of the attack but other staff members were in the building. Classes have been cancelled. The teacher is being treated in hospital and has not yet been interviewed by police. The anti-terrorism branch of the Paris prosecutor’s office has opened an investigation for attempted murder in relation to a terrorist act. The ISIS’ French-language magazine Dar-al-Islam recently urged followers to kill teachers in France, describing them as “enemies of Allah” for teaching secularism, AFP reports. Security has been strengthened at schools since the Paris attacks. Education Minister Najat Vallaud-Belkacem traveled to the Aubervilliers school on December 14, calling the attack an “act of great gravity” that was “unacceptable”. Aubervilliers is in the Seine-Saint-Denis department of the Ile-de-France region. In the 2010 census, Aubervilliers had a population of 76,000, including a large number of immigrants, mostly from North African Maghreb countries.